Lake Zurich, Illinois is an affluent suburb in Lake County, northwest of Chicago. About 20,000 residents live in the village. The community itself completely surrounds the body of water also known as Lake Zurich. U.S. News has named Lake Zurich as one of the "top 25 affordable places to live in the U.S." In 2006, Frommer's named the village as one of the top 100 "best places to raise your family." It also has been named by U.S. News as one of the "Top 25 Affordable Places to Live in the Country." Many larger Lake Zurich homes are for sale, and a prospective buyer will find many real estate options. Homes in Lake Zurich encompass many architectural styles, including Georgian Colonial, Victorian, and even Mediterranean. The discriminating buyer will have a good selection of 5,000-7,000 square-foot luxury estate homes. Lake Zurich real estate also includes developed lots and open land upon which one can build a "dream home." Those that want more modestly-priced Lake Zurich homes will find them. Split levels, bungalows, and ranches are among the Lake Zurich properties built a few decades ago that are today very affordable. Lake Zurich homes for sale even include condominiums in mid-rise buildings. Finally, many of the homes for sale in Lake Zurich are on beautifully landscaped, large lots. What is today Lake Zurich was initially settled in the 1830s and 1840s by both European immigrants and New England farmers. In the mid-19th century, German immigrants began to move into the area in greater numbers. In the 19th century, the lake was actually known as Cedar Lake. Lake Zurich was incorporated in 1896. It grew further when it was connected to the railroad in 1910. In the early 20th-century, Lake Zurich was a popular resort destination for city dwellers in Chicago. The Village of Lake Zurich maintains 32 parks which include two beaches, a sprayground and 22 playgrounds. The Lake Zurich YMCA offers a wide array of amenities including a 25-yard lap pool and warm water instructional pool.There's also a 25-foot high indoor rock climbing wall and the high ropes adventure course. The YMCA also features basketball courts, outdoor playgrounds, soccer fields, and sand volleyball. Area residents can benefit from their proximity to the Barrington. The Lake Barrington Fieldhouse is a 175,000 square-foot facility that is the largest multisport complex in the Midwest.The expansive facility includes eight volleyball courts, four basketball courts, and a turf field that can be used for anything from football to lacrosse. Lake Zurich families can enjoy one of the largest amusement parks in the Midwest by journeying to the nearby Gurnee and going to Six Flags/Great America, also in Lake County. Six Flags features some of the highest and fastest roller coasters in the country. A new wooden roller coaster, Goliath, takes riders at speeds of up to 72 miles an hour. In October, there is the "Maze 'Til Midnight" event in nearby Spring Grove. Attendees can enjoy the world's largest corn maze until midnight. There are 33-acres of fun, and participants are encouraged to bring flashlights or glow sticks. The attractions of Chicago are just 40 miles to the east. Lake Zurich is one of the most picturesque locales in the Chicago area, with its viewpoints and green parklands. 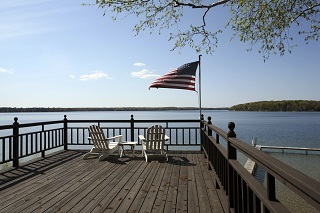 If Lake Zurcih is calling you, then should call us -- Ryan and Company Realtors®. We're experienced pros, and we know Lake County. Call us today, 847-526-0300. We can help you find the Lake Zurich home of your dreams. Click here for more information about the area of Lake Zurich! For more information on homes for sale in Lake Zurich, fill out the form below.